The Dow up 75 points after a narrowing of the US trade gap that offered hope of a better 2Q11 GDP estimates. Meanwhile, the government also reported a slight rise in those applying for unemployment benefits, with new claims up 1,000 to 427,000 last week. Sentiment was also boosted by the Greek Cabinet's decision to support a new round of austerity measure for its debt-ridden nation. As anticipated, the Dow finally had a technical rebound after plunging 520 points over the last six sessions and 6.8% from its 52-week high amid a slew of sluggish economic reports. Nevertheless, the mood remained fragile as the early intraday 134 points gain was fizzled off towards the end to end +75 points. 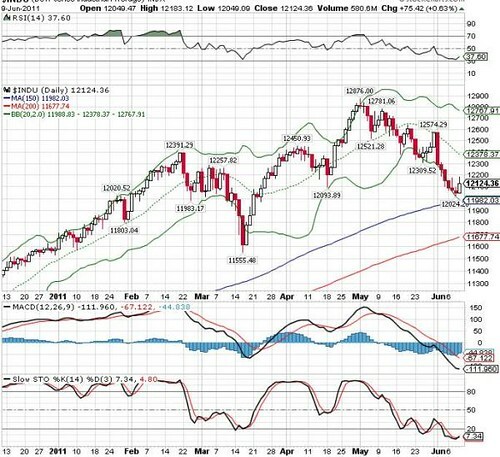 Technically, the Dow may continue its long overdue rebound for a while as technical readings are showing signs of uptick from its extremely oversold indicators. Immediate resistance levels are Immediate relief rallies zones are 12378 (mid Bollinger band) and 12451 (50-d SMA). Immediate supports fall on 12k psychological level and 150-d SMA of 11982 points. More solid support is the 200-d SMA of 11677 points.